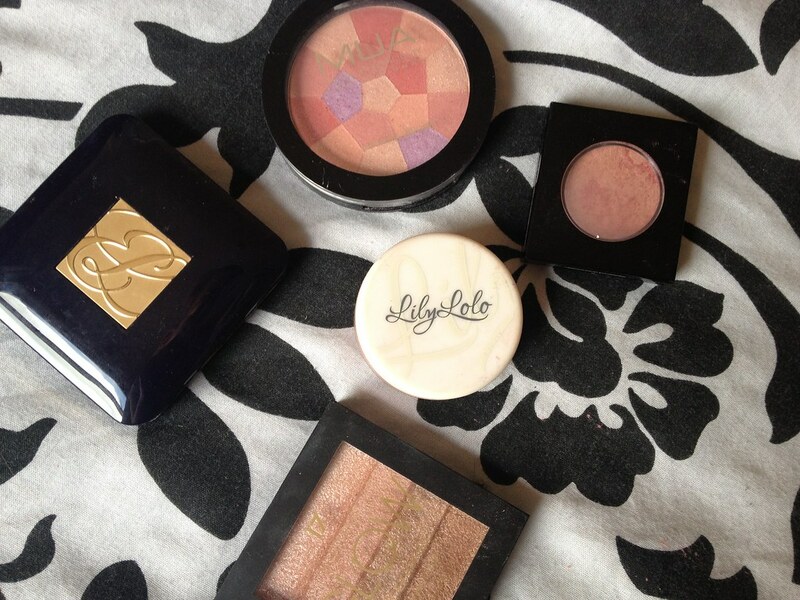 I'm very much a lover of all things pink and so I thought I'd share what my current most reached for products are - these aren't new and no doubt I've mentioned them all before at one point of another but I thought I'd throw them all together just to document the ones I've been using over and over again for months now. 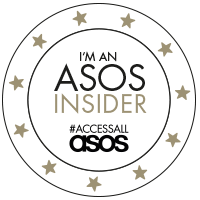 I'm not particularly fussy about brands or prices if it comes down to simply loving a product but as it turns out I've chosen items that fit in with almost every budget (I'm rather pleased with myself). 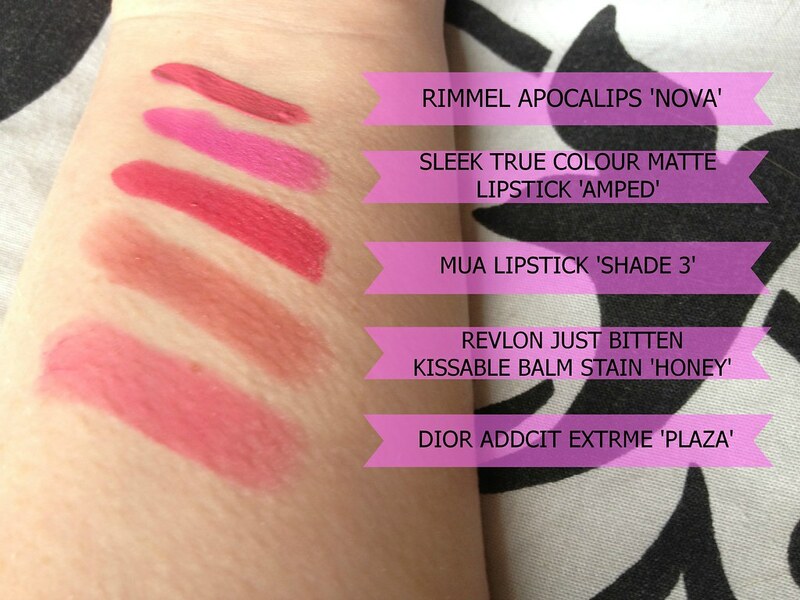 LIPS Rimmel Apocalips in 'Nova' £5.99 is definitely one of my most used lip products at the moment. I mentioned it as one of my five top lip picks for spring and summer in this YouTube video. It's such a pretty blue-based baby pink and I love the finish that it gives on the lips although it can be a messy application if I'm in a rush. Sleek True Colour Matte Lipstick in 'Amped' £4.49 is a brilliant drugstore dupe for MAC's Amplified Lipstick in 'Candy Yum Yum'. It's, again, a blue-toned pink but it's almost neon and really bright. It's beautiful and gives an amazing pop of colour. 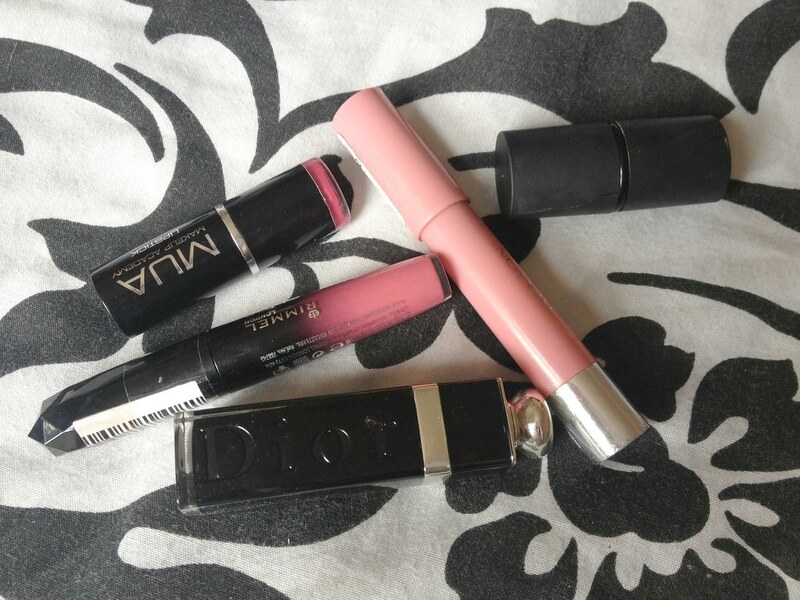 MUA Shade 3 Lipstick £1 is a really pretty fushia that works really well only the cheeks as well as the lips. I wear this a lot as it's buildable. It can be subtle or really bright and for such a budget price it's worth every penny. Revlon Just Bitten Kissable Balm Stain in 'Honey' £7.99 is one of those shades that seems to suit almost everyone and on me it's my 'my lips but better' colour. I love it because of it's durability and the fact it's fuss-free. It's also good for those times when something more refined and subtle is called for. Dior Addict Extreme Lipstick in 'Plaza' £24.00 is just stunning and possibly my all time favourite pink lipstick. Whilst it looks bright in the bullet it's fairly sheer when applied which means it can be built up to the desired colour you want. It's a true pink - nothing too blue or red based. FACE If you've followed this blog for a while then you'll already know that I'm obsessed with FashionistA blushes and particularly this FashionistA Custom Design Blush in 'New York' £4.00. It's a dusky buildable pink with a hint of shimmer that can double as a highlighter for the high points of the cheeks. I reach for this daily and find it really lasts well without looking too powdery. MUA Mosaic Blush in 'English Rose' £2.50 is a bargain dupe for Benefit's Boxed Blush in 'Sugarbomb'. Swirl all of the colours together to form a peppy peachy-pink which I imagine would suit most skin types. I love Lily Lolo Mineral Blush in 'Candy Girl' £7.00 because of how easy it is to blend although the product itself tends to get everywhere if you're not careful. 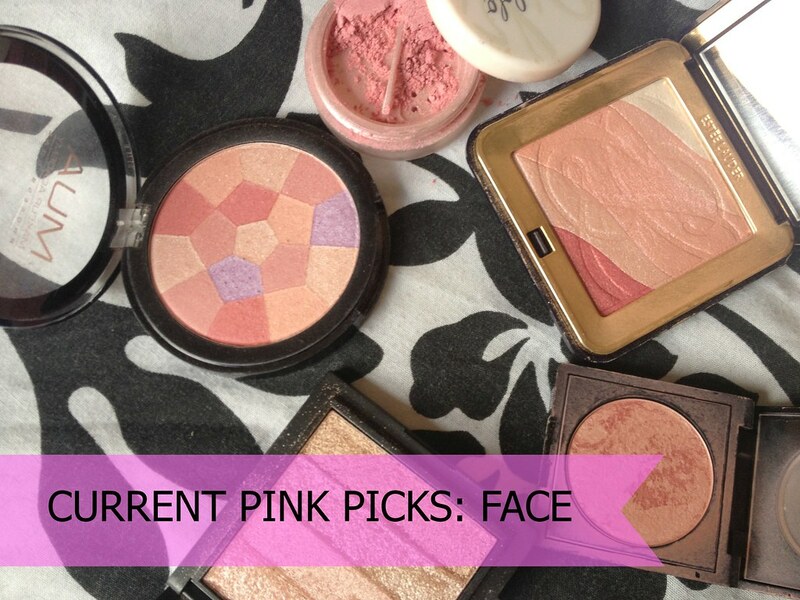 It's a very light pink that looks gorgeous in summer when skin has a hint of colour. 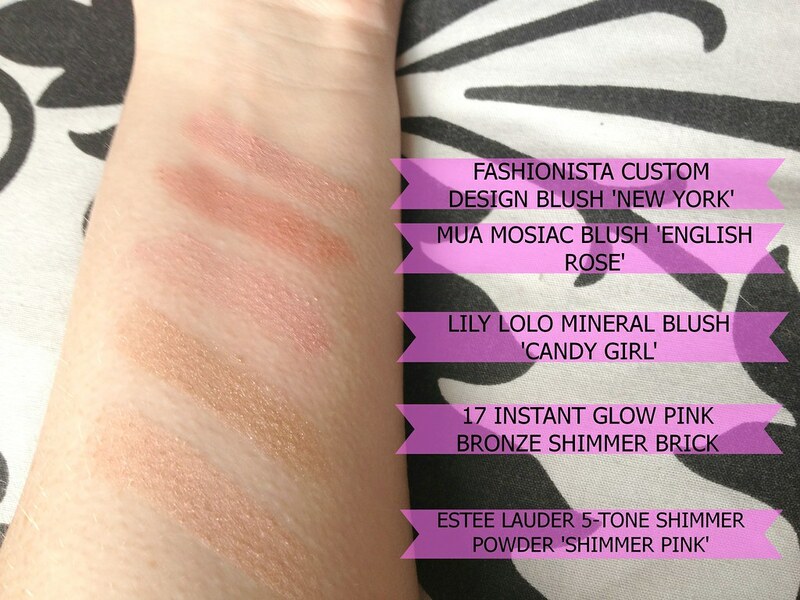 The 17 Instant Glow Pink Bronze Shimmer Brick £3.99 is a product I've recently dug out of my collection and started using. It's a reasonable dupe for the Bobbi Brown Shimmer Bricks that high-end lovers rave about. The colours can be used individually or blended together to create a golden-pink highlight which looks really good on tanned skin. Estee Lauder 5-Tone Shimmer Powder in 'Pink Shimmer' £30.00 is an alternative to the Dior Rose Diamond Compact that everyone seems to love. I'm personally very happy with this Estee Lauder alternative as it can be used for not only cheeks but as a highlighter and as individual eye shadows. I particularly enjoy using this product when I want something a little less obvious, something a bit more 'grown-up' as pinks can, dependent on the occasion, look a little immature. 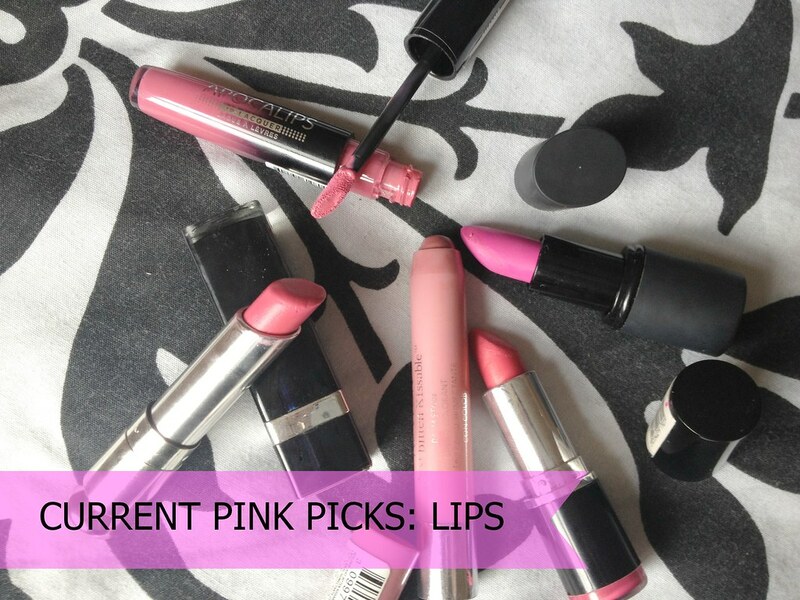 What do you think of my pink picks? Do you have any you think I would like? Recommend them in the comments below! that sleek lipstick looks so lovely I might just have to go and get it!